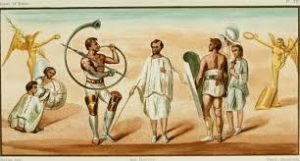 Roman Gladiators Fights: A gladiator (Latin: gladiator, “swordsman”, from gladius, “sword”) was an armed combatant who entertained audiences in the Roman Republic and Roman Empire in violent confrontations with other gladiators, wild animals, and condemned criminals. 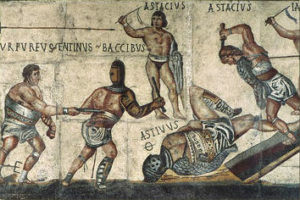 Some gladiators were volunteers who risked their legal and social standing and their lives by appearing in the arena. Most were despised as slaves, schooled under harsh conditions, socially marginalized, and segregated even in death. Romans liked watching other people die. They thought that was fun like maybe you think going to horror movies or watching Cops on TV is fun. They also believed that their gods liked Roman Gladiators Fights so that going to the fights was a sort of religious experience as well as being fun. Many Roman people went to big amphitheaters (like our football stadiums today) to see professionals fight (like boxers today). You went early in the morning, and paid for your ticket, and sat in your seat. Sometimes all the seats were free if a rich person had given money to pay for the show. Other times, you had to pay, and it cost more money for the good seats than for the bad seats, so the poor people had to sit way up top where it was hard to see. First men in armor came out and fought against wild animals, like bears or bulls or alligators or ostriches or lions or tigers. They captured the animals in faraway and brought them to the stadiums especially. Then the Romans treated the animals badly to make them hungry and mean so they would fight, usually, the men killed the animals, but sometimes the animals killed the men, which everyone thought was very exciting. You can still see this kind of fighting today in bullfights in Spain or France or Mexico. Around lunchtime, there would be a break, and people would eat their lunches. Some people brought picnics with them: bread and cheese and vegetables mostly. Other people bought food from the vendors who were walking around the stadium selling wine and water and stuffed pastries (like spanikopita). While people were eating lunch, in their seats, there would be a half-time show that sometimes had singers or dancers or a little play, or sometimes had criminals being killed. Sometimes the criminals were just brought out and had their heads cut off or were stabbed, but other times they were tied to posts and the bears came and attacked them, or they have pushed off a high tower, or something creative like that. Because the gods loved to see justice done, they also liked to see criminals being killed. After lunch sometimes there was another show, where men fought men. In big cities, these fights were to the death. In smaller towns, probably the men usually just fought until someone was hurt, though sometimes men did get killed. The men who were fighting were often, though not always, slaves.